Since 2008, we’ve had thousands of readers discover the ELI website and ELI Forums after they have received a Getty Images, Masterfile, Corbis, or some other stock photo agency’s or photographer’s “extortion letter”. Over the years, many have attempted to contact us through phone and email asking for help. Early on, we tried to help but eventually there were just too many requests for help and the help being requested overstepped reasonable time boundaries. So, we are unable to provide free one-on-one help. However, we have provided several help and support options. 1. The very first thing you need to do is to CALM DOWN and TAKE A BREATH! Tens of thousands of these extortion letters have gone out over the years. You are far from being alone. Getting an extortion letter from out of the blue is upsetting but not the end of the world. Your credit will not be ruined, you will not have to file for bankruptcy, and (most of the time) you won’t be sued. For most people and their situation, the bark is much worse than the bite. 2. This is one is a no-brainer. You should immediately remove ALL copies of the allegedly infringing images from your web server. Even the “hidden” ones. If it is anywhere on your web server, you are at risk. Also, if you have other images you don’t have receipts for or authorization to use, you should remove those as a precautionary measure. If you can get one extortion letter, you get more. And unfortunately, we know plenty of people who have received a few extortion letters. 3. GET EDUCATED. Do it as soon as possible. Don’t say you don’t have the time. You better make the time to get informed. It is you or your company at possible risk here. You received the letter so now YOU have a problem to deal with. It is YOUR problem. The problem will generally not go away by itself. Make the time to be informed and GET EDUCATED. 4. 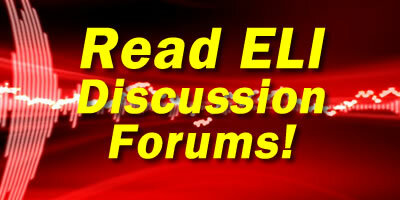 Read, browse, and search the ELI Forums. It is FREE! It is an online database with thousands of discussions. It contains a goldmine of information, advice, commentary, and research. Help yourself to it. 5. Watch the ELI Video Interviews & Updates. It is FREE! There are hours of recorded information to bring yourself up to speed. 1. Enroll into the 30-minute ELI Phone Support Call with Matthew Chan. This is an intense, no-nonsense, information-packed phone support session. He will provide you an overview and analysis of your personal situation, outline & evaluate your options, and give suggested courses of action. No two phone support calls are ever the same! 2. Enroll into Attorney Oscar Michelen’s Legal Representation Program. Oscar does not offer email or telephone consultations at this time. If you want to know more about Oscar, his style, and credentials, view the ELI Video Interviews & Updates or Google his name. Due to the volume of help requests, any emails or telephone messages asking for “just a few minutes” or “quick help” will go unanswered.